SASEBO, Japan - Amphibious transport dock USS Green Bay (LPD 20) departed its forward-deployed base of Sasebo, Japan, Jan. 25 for a routine patrol in the Indo-Asia-Pacific region. "Embarking, training, and operating with the 31st MEU remains our number one priority," said Capt. Nathan Moyer, Green Bay's commanding officer. "As we soon embark our Marines, I look forward to seamless integration as we train and work together while building stronger ties with partners in the region." Since that time, Green Bay has welcomed many new junior Sailors who are looking forward to upcoming operations. 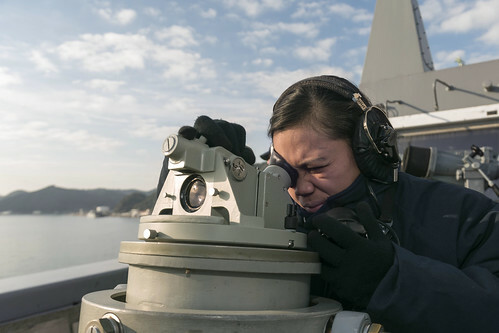 "I'm excited to go underway because this will give me the opportunity to do my job in a deployed environment," said Quartermaster Seaman Josephine Sablan. "I can't wait to get rolling and also visit future ports." Moyer shared the optimistic sentiments of his crew and recognized the benefits of being on patrol. "Although it is always difficult to say goodbye to loved ones, I can speak for the crew that we are all very excited about the opportunity to work side-by-side with our Marines and also the opportunity to experience different cultures," said Moyer. 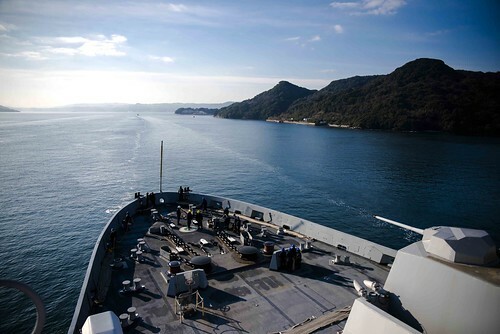 Green Bay is part of Amphibious Force 7th Fleet, the Navy's only forward-deployed amphibious force, headquartered at White Beach Naval Facility, Okinawa.